The world may be 2.4 degrees warmer by the end of this decade, and that could have deadly consequences for global food production, according to a new study overseen by Nobel Prize-winning climate scientist Osvaldo Canziani. Canziani, a Nobel laureate and former co-chair of the IPCC, oversaw the report. What the unidentified journalists who wrote this news story didn’t make clear is that Canziani is not a Nobel laureate in the normal sense of that term. He is a recipient of the Peace Prize by virtue of the fact that he worked on an Intergovernmental Panel on Climate Change (IPCC) report. His Nobel is the exact same Nobel that was awarded to Al Gore. This particular honour was bestowed not for scientific excellence but for helping to raise awareness about climate change. Type in Canziani’s name at NobelPrize.org and you won’t find a photo and a bio explaining how he has single-handedly advanced the cause of science – as in the case of, say, Albert Einstein. The only reason Canziani gets mentioned at all at NobelPrize.org is because the IPCC chairman referred to him during a speech. This news story illustrates perfectly how the IPCC’s Nobel gets used and abused in discussions about climate. When a journalist tells us someone has won a Nobel they’re implying they’re a genius. And if a genius thinks climate change will result in deadly consequences for global food production well then, we’d better sit up and take note. Thus, the Nobel has been reduced to just another way of bamboozling the public about regarding climate change. Since I began writing this blog post there has been a new development. I had intended to point you to a discussion over at HauntingTheLibrary that examines problems with the substance of the news story. For example, even though the authority of the IPCC gets invoked, the IPCC has never suggested that the global average temperature could spike by more than two degrees within a decade. In other words, the UEF is an activist organization. And since Canziani’s name is number three on the WWF’s Climate Witness Science Advisory Panel it would seem he has few concerns about mixing science and advocacy. So let me just mention that Canziani was co-chair of Working Group 2 for the IPCC’s 2001 report as well as the 2007 report. That was the working group responsible for the embarrassing and erroneous claim that Himalayan glaciers would vanish by 2035. (See here, here, here, and here.) Had the journalists who wrote the CTV news story been on the ball, this would have been an important piece of information to pair with all that talk about Canziani’s Nobel. Now here’s where things get really interesting. The CTV news story has been updated since I began writing this post. A study warning that the planet would warm by 2.4C by 2020, creating deadly consequences for the global food supply, is being debunked as false and impossible. …The AAAS has now removed reference to the study from its website. 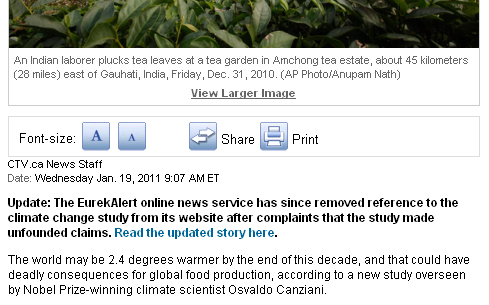 A spokesperson for the organization said they too spoke to climatologists who have also debunked the study. …stands by her report’s findings, which have been endorsed by Nobel Prize-winning Argentine climate scientist, Osvaldo Canziani. So here are two questions worth pondering: Might there be a problem with senior IPCC scientists associating themselves with activist organizations? And: Has the reputation of the Nobel Prize been enhanced – or tarnished – by this episode? 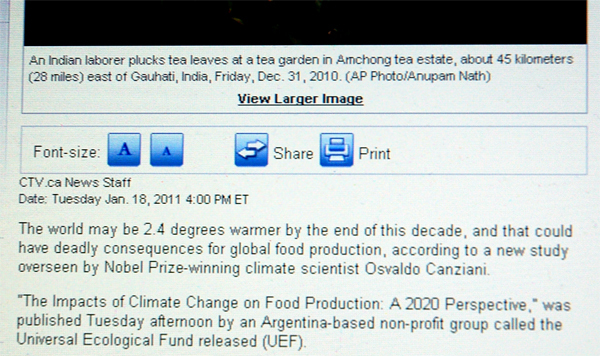 This entry was posted on January 19, 2011 by Donna Laframboise in activist scientists, climate bible, IPCC, media, NGOs, World Wildlife Fund and tagged activist scientists, climate bible, glaciers, Intergovernmental Panel on Climate Change, IPCC, media, Nobel Peace Prize, Osvaldo Canziani, Universal Ecological Fund, World Wildlife Fund, WWF.